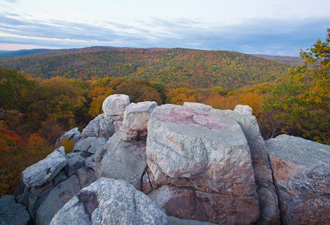 Catoctin Mountain Park was created 75 years ago to demonstrate how recreation and restoration can rejuvenate our society. Today it remains a premier recreational area within easy reach for much of the mid-Atlantic's population. The Casual Day Visitor — Amaya, age 10, convinced her parents to take her and the dog to the park on a warm spring day. The Junior Ranger activity immediately hooked her. After hiking the park's trails, the family became experts on charcoal production, whiskey distillation, and leaf identification. Their dinner included Amaya's first taste of forest bounty: a morel mushroom picked in the woods. With 25 miles of trails in the park, casual day visitors can find activities to match their needs or abilities. Plan for the season: wildflowers like trout lily, mountain laurel, and lady slippers appear in the spring. Migrating birds fly through in spring and fall, though woodpeckers, raptors, and some songbirds remain all year. Autumn colors — maple oranges, dogwood purples, tuliptree gold — attract a great number of visitors. 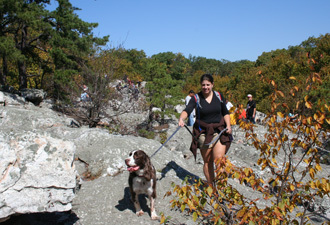 Park visitation peaks in October. The region has much to offer at any time of year, including several other national parks nearby. Adjacent to Catoctin Mountain Park, Cunningham Falls State Park features Maryland's tallest cascading waterfall and a lake for swimming. Group Gatherings — Marty, age 83, paused on the boardwalk trail to take weight off his prosthetic leg. The chestnut aroma in last night's cabin took him back to a summer that changed his life forever. Childhood cancer had stolen his leg. Camp Greentop, one of the first accessibility-designed facilities in the United States, returned to him an indomitable spirit of outdoor adventure. The camp was built in 1937 for children with disabilities, to bring them to the freedom of the great outdoors. 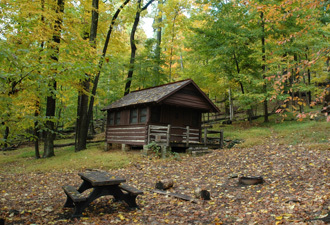 Camp Greentop can accommodate groups of 60 or more. Visiting groups create life-long memories by staying in the park. Overnight lodging alternatives include a primitive tenting area, rustic cabins, and a modern dormitory. Three of the park's cabin areas feature commercial-grade kitchens; two have swimming pools available for overnight guests' use. Adventure Seekers — Friends of James and Gina thought they were crazy to tackle the 27-mile Catoctin National Recreation Trail in the dead of winter. Skiing to the Adirondack shelters proved more fun than hiking. A side trip to climb Wolf Rock helped ward off the chill. They saw no other human tracks in the snow, but coyotes, foxes, and even a bear had left their marks. After two days of outdoor adventure, James and Gina felt like they were ready to take on the Grand Canyon next year. The park offers outdoor activities for most serious adventurers. Whether the adventure you seek involves snowshoes, map & compass, horses, climbing gear, or fly-fishing tackle, you'll find it at Catoctin Mountain Park. Plan Ahead — Portions of the park occasionally close with short notice, so check the website or call before you visit. The central road closes for the winter, and the unmarked trails may be difficult to navigate under snow cover. Catoctin Mountain Park is highly accessible for all ages and abilities and offers enjoyment, solace, and recreational opportunities for everyone in every season.